Why use yoga themes in your children’s yoga classes? I saw this question in a kids yoga online forum and thought it was a great question. You’ll find loads of yoga theme ideas on our website (for ages 2 to 8), and I take using themes for granted because that’s how I was taught as a primary school teacher. This is a topic that I’m extremely passionate about! One of the challenges that I hear from our community time and time again is how to engage their students and capture their attention. For this reason, I’m a huge fan of teaching through themes because I can see the huge value in connecting the topics to the children’s lives and engaging them in their yoga practice. Ultimately, our goal is to plant a seed so that they can continue their own yoga practice throughout their lives in a way that works for them. We are merely facilitators in their yoga practice. You’ll never know the one breath, pose, or meditation that will make the biggest difference in the life of a child. 1 | Children can build meaningful connections between what they are learning or their surrounding environment to the concepts of the yoga practice that you are introducing. 2 | Choosing themes that are relevant to the children’s lives makes the yoga practice more engaging. 3 | You can scaffold their learning when you introduce a new topic through breath and yoga poses (ex. acting out the life cycle of a pumpkin, followed by a guided meditation). 4| Teaching from a specific theme allows you to bring in other subject areas to your yoga practice (ex. journaling, science experiments, nature walks, field trips, or map study). 5 | Getting the children to choose their own themes enables you to cater to their specific interests (ex. holiday, seasonal, or favorite topics), thus engaging them further in the experience. 6 | Deciding on a particular theme allows you to structure your yoga lesson to be cohesive and offer a deeper meaning (ex. a summer yoga theme might include beach yoga poses, ocean waves breathing, beach journaling, beach props, and beach guided meditation). 7 | Themes provide you a jumping-off point to go on pretend journeys around the world to learn about different people and places. 8 | If you choose themes that the children are familiar with, then they will likely feel more confident. 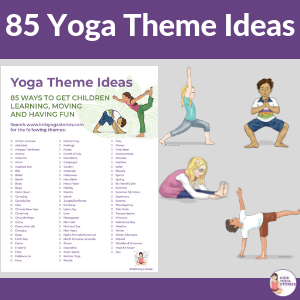 9 | For children who are reluctant or anxious to join a yoga class, teaching the class through their favorite theme might be the way to hook them into the class. 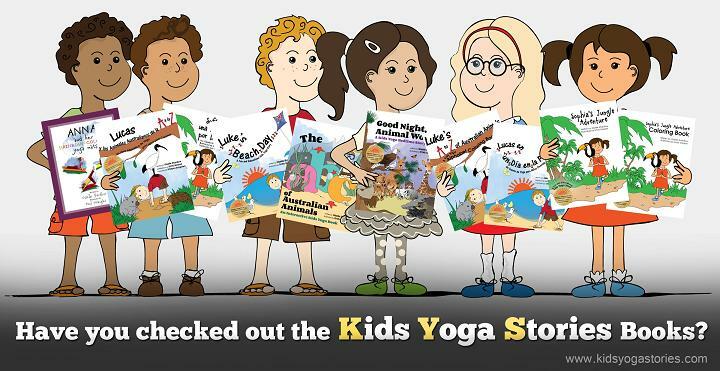 10 | Introducing yoga to children through themes that they love helps to pique their curiosity. One boy said to me recently, “You mean I can learn about fall by moving my body instead of sitting at my desk?” This was his first introduction to yoga, and he couldn’t wait to come back. The kids yoga teacher who originally posted that question asking why people taught yoga through themes was not a fan of themes. Of course I completely respect that some educators choose not to teach yoga based on a theme. We each have our own voice, and it’s more important that you are true to your own teaching style. I can also see how being attached to a specific theme and lesson plan might take you away from the essence of connecting with your children and being in tune with their needs. At the end of the day, we all share two common passions—working with children and the benefits of yoga. So do whatever feels right to you, but I just wanted to share what I learned from my educational training on the benefits of teaching through themes. 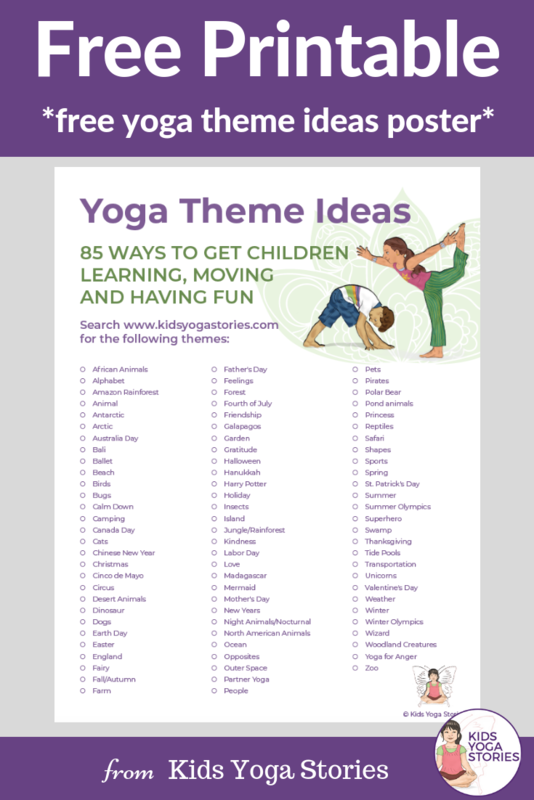 With that, please feel free to download the “Yoga Themes Ideas” poster below. Search our website for any of the themes and be sure to email me directly if you have any special theme requests. I’m always happy to help! 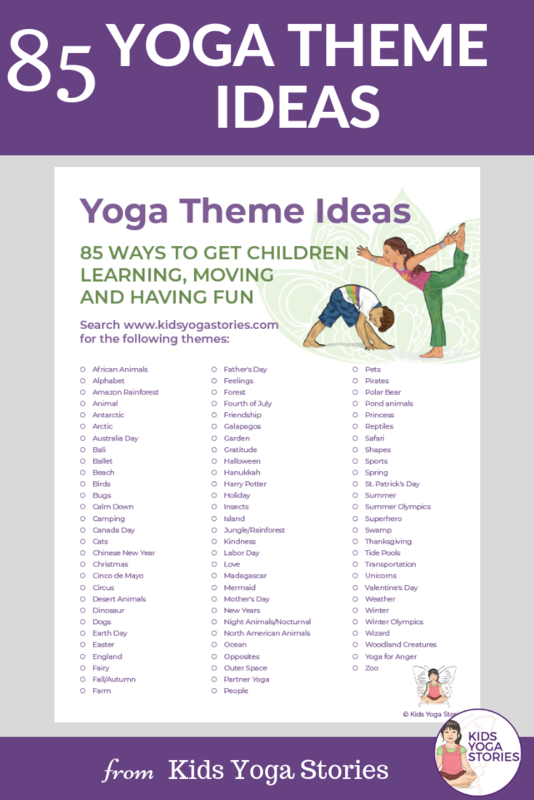 Purchase the Monthly Kids Yoga Themes in PDF Download. 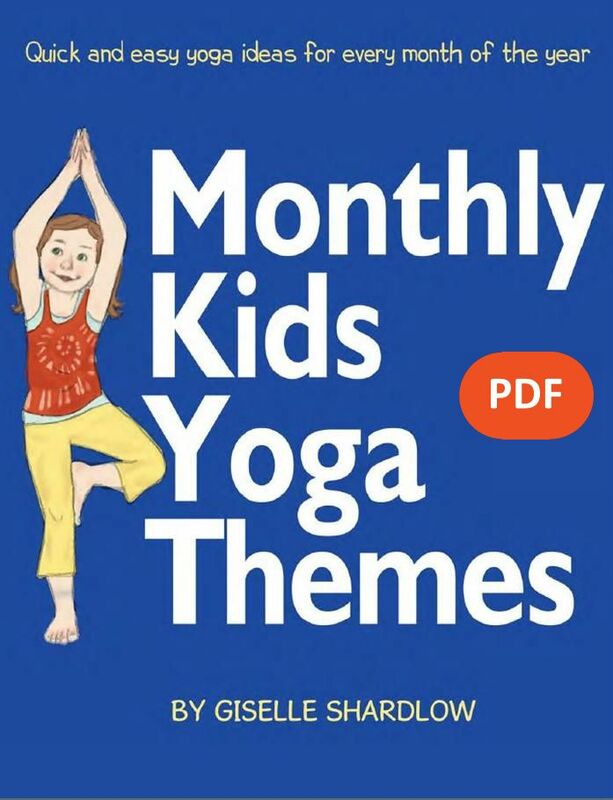 Purchase the Monthly Kids Yoga Themes in paperback. Are you ready to incorporate yoga into the classroom in a fun and unique way? Do you want to teach chair yoga to your child at home? To spark your imagination, each monthly theme includes five chair yoga poses for kids and five recommended children’s yoga books. 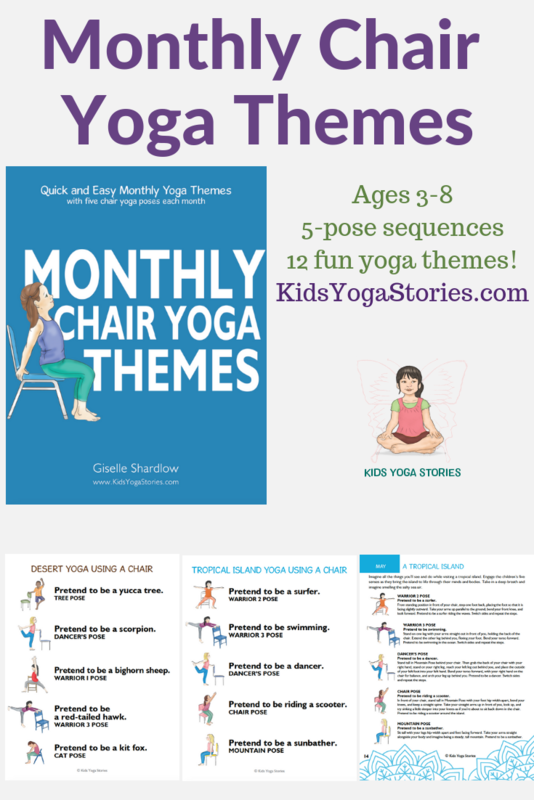 This 44-page eBook is for teachers, parents, kids yoga teachers, caregivers, and health practitioners looking for simple, convenient ways to add chair yoga into your curriculum, classes, or home life. Age group: ages 3 to 8. Get your copy of Monthly Chair Yoga Themes here.